Is free legal music service Qtrax too good to be true? Watching the Qtrax PR fiasco unfold over the last few days (“we have all four majors on board, err, no we don’t”, “we’ve launched, err, no we haven’t”) provided a great lesson in what not to do when launching a new product i.e. lie to reporters. However, a ton of questions remain unanswered, not least of which being: is a free and legal music download service on the scale of Qtrax too good to be true? But first, a recap of what Qtrax claims to be offering. Qtrax is a free and legal peer-to-peer (P2P) music sharing service where users can “discover new music and legally download full-length, high-quality versions of their favorite songs while compensating both the artists and the record labels through non-intrusive and relevant advertising”. In order to achieve this, the service claims support from the four “major record labels and all of their respective publishing divisions”. The result is a service able to legitimately offer 5 million tracks, growing to 25 million, and these could also include “grey music” i.e. bootlegs and live recordings or other unofficial releases, or so Qtrax claims. The only catch is that tracks are wrapped in DRM to, presumably, restrict playback to within the Qtrax desktop player where the ads are served (Windows PC-only, with Mac support forthcoming). Magically, however, iPod support is also on its way, though not sanctioned by Apple, and the service will work with other portable music players. 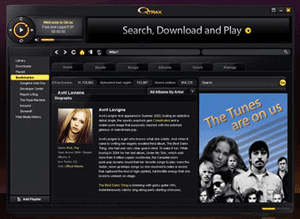 Both Sony BMG and EMI also confirmed to Times Online that Qtrax did not have the right to use their recorded music catalogue – contradicting a statement on Qtrax’s site, which was down periodically during the morning because of ‘overwhelming demand’, that its users would have access to 25 million songs. Frankly, I find this unsurprising. If Apple can’t persuade all four majors to license their catalogs for DRM-free paid-for downloads, and even Amazon, seen as the company most likely to rescue the music industry away from the grip of Apple, is only able to do so on a trial basis (with regards to Universal and Sony BMG at least), then what chance does Qtrax have with an almost completely new and unproven model. To put this into even greater perspective, both SpiralFrog (see our review) and We7, two services that have offered ad-supported music downloads for significantly longer, are only able to offer a catalog of around half a million tracks each one million and 80,000 tracks each. Why? Because the labels are far from convinced that advertising dollars can ever replace revenue from paid-for downloads or CD sales. Also note that Nokia’s “free” eat-all-you-want subscription service, “Comes With Music”, only has the support of one major label: Universal. The point is that the majors are very much at the experimental stage, taking a cautious approach to new business models, dipping one toe in the water. As a result, I’m sure a few of the major labels will at least license some of their catalog to Qtrax for some of the time. Then they’ll sit back and wait for the hard numbers to come in. That’s the trend we’re seeing across all new models for monetizing music. As for circumventing Apple’s closed DRM technology used on the iPod, Qtrax has no chance. Others such as Real Networks have tried to play that cat and mouse game, eventually to concede defeat and give up. Mousebender: (broad Yorkshire) Nothing to listen to! Mousebender: (normal accent) In a nutshell. So I thought to myself, ‘an excursion into pitch, melody and harmony will do the trick’. So I curtailed my Walpolling activites, sallied forth and infiltrated your place of purveyance to negotiate the acquisition of some new music. QTrax: Oh, I thought you were complaining about the cheese! Mousebender: (normal voice) Heaven forbid. I am one who delights in all manifestations of the fermented curd. Mousebender: (normal voice) Now my good man, some music, please. QTrax: Yes certainly, sir. What would you like? Mousebender: Well, how about a little Led Zeppelin. QTrax: I’m, afraid we’re fresh out of Led Zeppelin, sir. Mousebender: Oh, never mind. How are you on Twista? QTrax: Never at the end of the week, sir. Always get it fresh first thing on Monday. Mousebender: Tish tish. No matter. Well, the new Chromeo album, then, if you please, stout yeoman. QTrax: Ah well, it’s been on order for two weeks, sir, I was expecting it this morning. Mousebender: Yes, it’s not my day, is it? Er, Alicia Keys? QTrax: Normally, sir, yes, but today the van broke down. Mousebender: Any Nation of Ulysses? Mousebender: Bjork, Goldfrapp, Pharoah Sanders, Joy Division, Sun Ra, Juan Atkins, Gil Scott Heron, Black Dice, Captain Beefheart, Public Image Limited, Justice? QTrax: Ah! We do have some Justice, sir. QTrax: It’s a bit noisy, sir. Mousebender: Oh, I like it noisy. QTrax: Well as a matter of fact it’s very noisy, sir. Mousebender: No matter. No matter. Hand over le musique de la Belle France qui s’apelle Justice, s’il vous plaît. QTrax: I think it’s noisier than you like it, sir. Mousebender: (smiling grimley) I don’t care how incredibly noisy it is. Hand it over with all speed. QTrax: The cat’s eaten it. Mousebender: You do have some music, do you? Mousebender: No, no, no, don’t tell me. I’m keen to guess. Mousebender: Splendid. Well, I’ll have some of that then, please. QTrax: Oh, I’m sorry sir, I thought you said QTrax. Mousebender: Slovakian Gypsy Punk Music? Mousebender: Peruvian Nose Flute Music? QTrax: Not today sir, no. Mousebender: Well let’s keep it simple, how about The Beatles? QTrax: Well, I’m afraid we don’t get much call for it around these parts. Mousebender: Not call for it? They’re the single most popular band in the world! QTrax: Not round these parts, sir. Mousebender: And pray what is the most popular artist round these parts? QTrax: Yes, sir. He’s quite staggeringly popular in the manor, squire. QTrax: Yes sir, he’s our number-one seller. Mousebender: OK, I’m game. Have you got any, he asked, expecting the answer no? QTrax: I’ll have a look, sir…nnnnnnooooooooo. Mousebender: It’s not much of a music site really, is it? QTrax: Finest on the internet, sir. Mousebender: And what leads you to that conclusion? QTrax: Well, it’s so clean. Mousebender: Well, it’s certainly uncontaminated by music. QTrax: You haven’t asked me about Modern Lovers, sir. QTrax: (to cheese eaters) Told you so. Mousebender: Have you got any Modern Lovers? Mousebender: No, that figures. It was pretty predictable, really. It was an act of purest optimism to pose the question in the first place. Tell me something, do you have any music at all? Mousebender: Now I’m going to ask you that question once more, and if you say ‘no’ I’m going to shoot you through the head. Now, do you have any music at all? Mousebender: (shoots him) What a senseless waste of a million dollar launch party.